(Radnor, PA, July 18, 2012) – Community Energy Solar (Community Energy) today announced that it has closed financing and commenced construction of its six megawatt (dc) Keystone Solar Project in Lancaster County, Pennsylvania. Exelon Generation (NYSE: EXE) and Community Energy’s retail marketing division committed to buy the output and back the financing for the project, which will supply the highest-quality green electricity – local solar power – to customers who sign up for a share of the generation. Several early high-profile customers have already signed up for a share of the output, including Franklin & Marshall College, Eastern University, Clean Air Council, and most recently, the Philadelphia Phillies and Millersville University. 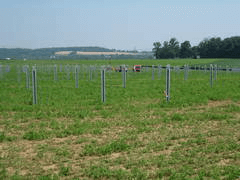 The solar panels are being installed on driven posts (see accompanying photo of the site) without concrete to avoid soil disturbance, such that the site will be maintained with selected cover vegetation to preserve and improve organic soil content. About 20,000 Canadian Solar 290 watt modules are being installed on fixed tilt, ground-mounted aluminum racking provided by Schletter, and will be interconnected to the PPL Electric grid at 12 kilovolts with AE inverters and platforms. The Project will supply about 7.5 million kilowatt hours per year of solar generated electricity under a fifteen-year power purchase agreement with Exelon. The annual environmental benefit equals that of about 3,000 zero-emission passenger vehicles or 285,000 newly planted trees growing for ten years. The solar project received financing and funding from the Ben Franklin Technology Partnership, the Sustainable Energy Fund and the State of Pennsylvania. groSolar, a commercial solar contractor, is serving as general contractor to complete construction, targeted for this Fall. About 50 construction, electrical, and other jobs are being created at the site this summer.